From My Home to Yours... Happy Holidays! From My Home to Yours… Happy Holidays! Home this Christmas is vastly different from the one I shared with you just a couple of years ago. There's no softly falling snow, brightly-lit 13 foot tree surrounded by a mound of presents, or plans for dinner with close friends and neighbours at a prettily set table. Instead, there's just one string of crazy green-and-red shotgun shell lights hung over the couch in the RV, some festive headgear and some holiday cards that I have yet to send. Christmas dinner will likely consist of frozen turkey bits, brussel sprouts and packaged mashed potatoes from the local grocery store. With luck, we will share our bonfire and some holiday cheer in the evening with our fellow vagabonds at this California desert State Park. Wherever, whatever, whomever — it's all perfectly lovely! The real gift is that we can connect with the special people in our lives (like you!) far away through Facebook, email, blog posts and Skype. So, that's my wish for you this holiday season — that you appreciate the now — what you have, wherever you are (home or away) and whomever you are with. P.S. I'm off to re-build tonight's bonfire setup. Jasper wrecked it in his pursuit of the used paper plates from lunch. LOL. Thanks Ros for the link. Sounds like my kinda holiday. I used to stress about how the house was decorated and the tree, food etc., but that’s not a real Christmas, now it’s about the one’s we love and our stress levels being a minimal. My goal for this year is to get this affiliate marketing off the ground and actually making some money. With your help I know I can get it done, afterall I took a real estate business from nothing and made it work so I can do this too. Keeping up with your work has really inspired me, so keep up the good work and may you have a great year as well! Merry Christmas. Your Christmas sounds wonderful. Enjoy yourself. 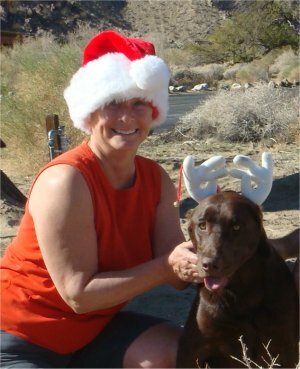 Years ago, my late husband and I spent many Thanksgiving holidays at Furnace Creek campground in Death Valley – and a few Christmas holidays as well. We celebrated while hiding out from steep winds in a trailer that pulled behind one of our motorcycles – or huddled up near the Weber barbecue on which the turkey happily roasted. Merry Christmas, fellow traveler – and many Happy New Years as well! Wow Ros, good on you for the traveling! Hope you have a great time and a very Merry Christmas!!!! Thanks Ros. Enjoy the holiday, and have a happy, healthy, peaceful and prosperous new year. A friend sent me this link to a performance of the Military Wives Choir. Being a part of the British community, you probably are familier with them already. But, just to be sure, and thinking that you would appreciate them, their courage, attitude and talent, I am sending it to you anyway. You have a chocolate lab too! Lol Jasper was on a mission, Babe is our chocolate lab. It’s one thing about owning a lab, there are so many stories they bring, and I just love it. Babe is our 2nd lab. Boscoe was the first. Your Outdoor holiday sounds really great to me. I can’t agree more, life is in the now. a person can glaze that over when focus is on the past or what is to come. One extreme to the other huh? Merry Xmas from cloudy, muggy, sunny Auckland, New Zealand where it never snows but sometimes pees down on Xmas Day. We will not be cooking, (did attempt to make potato, beetroot and egg salad) but visiting some old friends here and there. I agree, I think everyone can find things to be grateful for like connecting with the special people in our lives and the gift God gave to the world in Jesus – the real meaning of Christmas. Thanks Ros! It sounds perfect! I wish we could all spend more time in nature. I was a Game Warden for many years and I have lost count of the times I pine for that life! Have a great few days and – as you say – live for the moment! Thanks for you vise and kind words – Living NOW – is very important. A very good friend of mine have worked hard to achive all her goals for years, you know a beautiful home, a summer cottage, 3 children, cars, etc – everything made possible through a demanding job and career. 3 months ago they found a tumor in her left breast…… it simply broke my heart. But I’m sure she will get through this illness, she is strong as a rock – but it made me stop and think about what really is important in our lives. All the things we buy and surround us with are not really important at all – but being together with loved ones, sharing and laughing, watching the sun go down, preparing a nice dinner, staying in bed for two days, finding time playing football or making a snowman with your kids – these “soft” values are the real things in life somehow – by living right now and enjoying every moment we fill our lives with greatness and it will lea to happiness in a strange way!! So I hope you will enjoy your Christmas – not by stressing around buying lot’s of things, but by having a nice cosy time with your dearest ones. – and of course “Happy holidays” to you Ros. and Happy Holidays.in the camp. Can I monetize the following…? My noted website WhiteRockReporter I should probably revamp and send to a guru for analysis..a source I have been told to use and available through ELANCE. 2012 will be a major year for change for me. Standing still and stuck and ….juck..
Symptomatic and not an unusual situation for most in this business. Of course I do need traffic..too. Today I see myself as a ‘Video & Audio Content Communication Services Provider to Professionals in Business’. I have coupled my talkfusion business http://www.talkfusion.com/1270808 to my association doing video productions for business owners. With your many years of experience can you see any tangible indicators directing me still towards the field of work ‘affiliate’ marketing. I just don’t want to sell vacuum cleaners. Or live on Clickbank. What tools do you have and do you recommend from your own tool box? You have a great way of communicating. If any of the above will trigger any response from you I am most appreciative. That sounds such a nice, relaxed way to spend Christmas. I thought that you would have a jumper on, though, at this time of the year? Looks as though Jasper approves. merry christmass thanks for all the info over the years.Heres to a happy new year. All Good Wishes to you Ros as well ! I tried your link and it malfunctioned !! Thanks for this one, I like your head gear(both). Reindeer Dogs in California eh! Hmmmm….. Thank you sharing – not just today but all of the days of the year. It is appreciated and I think you for it. Best wishes for the holiday season and for 2012!! !